Track list and ‘listen again’ link for ‘The Mystery Train Radio Show’ 29/04/18. and listen live to 'The Mystery Train Radio Show' every Sunday - 10pm (UK). Track list and ‘listen again’ link for ‘The Mystery Train Radio Show’ 22/04/18. 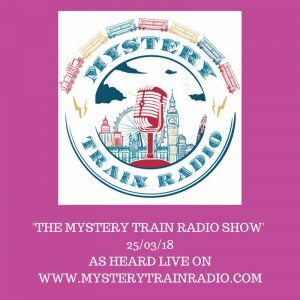 Track list and ‘listen again’ link for ‘The Mystery Train Radio Show’ 15/04/18. Track list & ‘listen again’ link for ‘The Mystery Train Radio Show’ 08/04/18. A copy of the playlist replicated below. Mixcloud page now up and running. A quick not to say a new ‘Mixcloud Shows’ page has been added to the website (link placed under the ‘Shows’ page). Older ‘Mystery Train Radio Shows’ will be available to listen to via this page going forward. Sunday’s show (25/03/18) is the first to be added.